Keno is a fun and easy casual casino game which offers big rewards when you hit your spots, but playing at land-based venues isn’t always convenient. Online casinos offer an array of keno variants so you don’t have to wait for the next game to start or locate a sharp pencil to fill the form in. Additionally, real money keno on the Internet offers a better house edge than its land-based counterpart. 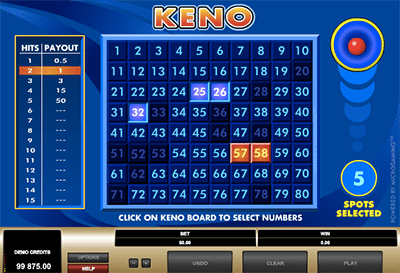 With proper strategy Keno is a fun and easy game to play. Can players from the USA play keno online? The United States has strict laws in place regarding online gambling, but there are some reputable casino sites with keno games available that do accept players from the USA. While you may not be able to sign up at the casinos recommended in the information below, please visit our United States guide for more information on which real money casino sites legally cater to US players. Keno is available online extensively, however we recommend only playing at secure sites since we are playing with real money – these sites will protect your details and transactions, not steal them. The following keno sites are licensed by third parties and have strong reputations earned by real player reviews. Each offer Random Number Generator (RNG) keno games, and one site even has a live dealer variant. Simply click our links for direct access and you can sign up and become a member, opting in for the corresponding welcome bonus. Playing keno on the Internet for real money is easy and follows the rules of traditional keno, just translated in the digital space. Every online keno games has set paytables for the payout players receive for their chosen numbers that match the randomly drawn final number results. All paytables vary between games or sites, so shop around accordingly to get the payout rates you like best. Typically, online keno house edge sits between 3% to 30%. Once you have signed up to one of the secure online casinos above, you can pick your preferred keno title and get playing. We have chosen three of the most popular titles to show you just how easy it is to win real money on Internet keno. Keno, by Microgaming, is considered to be a traditional RNG keno game and can be found at all online casinos powered by the top provider. Players get started by clicking on the title where 80 spots are available to pick from. Players choose 15 and 20 are drawn when you press play. Matching numbers will change colour and the paytable will indicate how much you have won. There’s a minimum bet of $1 and a maximum of $50 per game, with the pays clearly detailed to you before you get stuck into gameplay. Your winnings are paid out in accordance to the number of spots picked and the numbers picked correctly. You can find Microgaming’s Keno at RoyalVegasCasino.com and AllSlotsCasino.com. 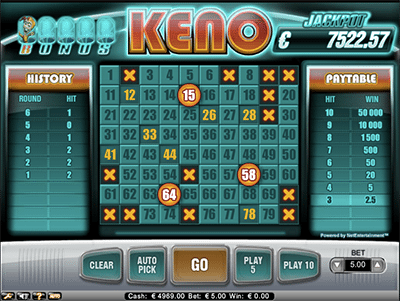 Net Entertainment also offers a keno title but with a bit of a twist – a progressive jackpot is attached. This grows every time a player plays and can get up into the five figure mark. Bonus Keno offers 80 numbers, with up to 10 spots available to pick and 20 drawn. The minimum bet is $1 and the maximum bet is $5 per game. You can also opt to play five or 10 games in a row without changing your bet size – similarly to how you can at land-based venues. The jackpot is won by scoring a J symbol in one game, while a bonus game is also on offer triggered by five or more of the joker symbols. This is measured in the metre in the top left hand corner, and is cumulative over continuous gameplay. Once you have scored all five you will score double the profits. You can find Bonus Keno at GdayCasino.com and Guts.com. Live Keno is a unique experience you won’t even find at your local keno venue like a pub or club. It has a real dealer handle and draw the keno balls from the machine, all recorded and streamed to your device in real time. This has been created by Ezugi, the live dealer specialists and is available at G’Day Casino at certain times of the day. There is an interactive betting layout, a paytable, and a live chat box to talk to other players and the dealer. The games are played every three minutes, so you do have to play at this pace – unlike RNG software where you can speed it up or down. Just be sure to place your bets before they are called. There are 20 balls drawn from 80 and up to eight eligible to be picked, with a minimum bet of $1 and a maximum bet of $50 on offer. You can only play Live Keno at GdayCasino.com. 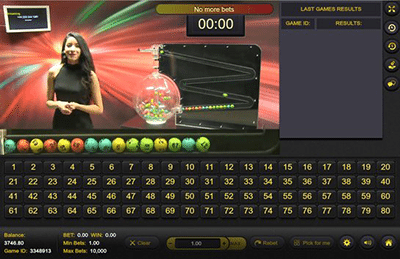 Playing keno online is quite different to playing keno at a pub or club – despite both being operated by RNG software (excluding live keno online). At land-based venues, such as pubs, clubs and RSLs, players have to manually fill a form out, find a cashier and pay them, and then get the form scanned to be paid their winnings. Online keno, on the other hand, allows you to click to fill the form out, play at your own pace, and automatically be paid any winnings. Additionally, the house edge of keno online compared to land-based keno is significantly better. Land-based keno is considered to have a house edge of anywhere between 20% and 35%. Online, however, games have a house edge of 10% of less. We recommend opening an account with one of the aforementioned online casinos to get the best possible gaming experience when it comes to real money keno, and you could potentially be pocketing some big rewards. Clubs ACT is releasing a five-point plan to combat problem gambling, requesting government appointed officers and tougher territory-wide exclusion policies.